Most presidents preside over deficits, as shown in the Heritage Foundation chart above. Over the past 50 years, we’ve seen deficits both big and small. 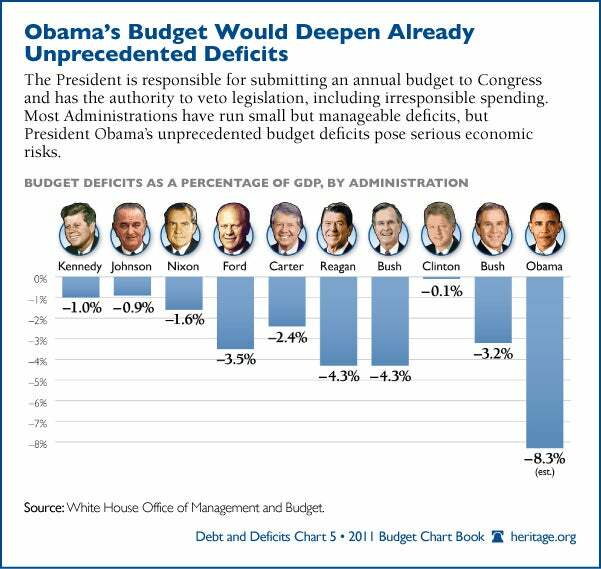 But President Barack Obama beats out his predecessors when it comes to the size and scale of the federal deficit. According to the White House Office of Management and Budget, the country ran a deficit averaging 8.3 percent of GDP for the first two years of the Obama administration—the largest deficit in the past 50 years. That’s nearly double the deficits run by presidents fighting the Cold War. Check out this chart and several others in our Budget Chart Book. The United States can no longer run this sort of unsustainable debt. There has to be a dramatic policy change at the federal level. Read Heritage’s plan to save the American dream and fix the debt crisis. I received a letter from Senator Jim Demint, thanking me for being a member of Heritage. I thought that was very nice. Just recieved the letter from Senator Jim Demint. It was a “little story” on one hand, on the other…I live in Christmas tree capitol OREGON. I would have thought Christmas trees growers a conservative bunch, but like so many of us we are conservative if it lines our pockets. Kind of reflects our government.